The Garden – Dig Delve – An online magazine about gardens, landscape, growing & making. Before we arrived here the land had been grazed up tight to the hedges and to the farmyard, which held the cattle back from the house. That autumn, in a tiny strip of garden sandwiched between the front of the house and the concrete path to the door, blazed a clump of bright pink nerine and, the following spring, a slash of blue muscari marked what we later found to be the dog cemetery. Above the milking barn to the east a vegetable plot measuring four paces wide and double that down the slope was still in evidence. Raymond’s brother, Norman, had kept it cleared with a wonky-wheeled rotavator that coughed and spluttered black smoke and sported an arm held in place with baler twine. He tried to sell it to me with the advice that, to turn it off, it needed a thump with a broken-handled lump hammer. Needless to say I didn’t take him up on the offer. When you arrive somewhere new, it is important to take the time to look. So the three loads of plants that I brought from the garden in Peckham were shoe-horned into my ration of cultivated ground. The ground, only tickled over by the rotavator, revealed a hard pan a couple of inches down and soil that had clearly not been improved for some time. But I was grateful, as it was free of weeds and provided me with the time to think. Although it was clearly going to take time to decide how to make a garden here, I made a move in the first winter so as not to miss the planting season. It felt important to repair and reclaim boundaries so, over the Christmas holidays, we replanted a broken hedge on the west boundary, that was missing more teeth than it retained and removed the rickety barbed wire fences that stopped our eyes from seeing the stream below us sparkling in the low winter sunshine. I walked the land daily, looking for the best location to plant a new orchard and took the lead from a dead stump in the field beyond the barns where our neighbour Glad said there had once been plums. 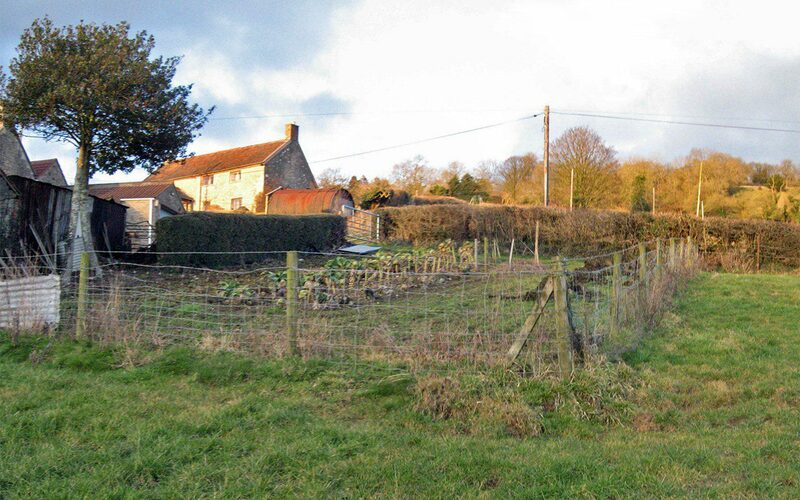 We planted over thirty fruit trees here – apples, pears and plums – a hazel coppice at the base of the slope below them and, in the top corner of the field above, a blossom wood of natives to provide cover, shelter and food for birds. I also started the process of introducing more oaks, both as hedge trees and gate markers. The land felt in need of a new generation of trees and these were good moves to make straight away. After five years here we already have trees we can stand under, a complete and continuous hedge and the beginnings of a fruit and nut harvest. 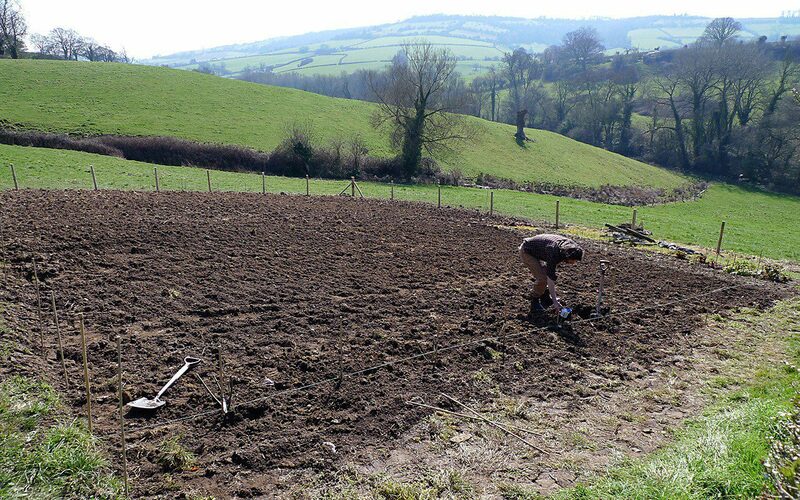 The following spring I expanded the little vegetable plot, with a local farmer helping to turn in part of the field and partition the ground with a stock proof fence. I will write more on the balance between farming and gardening another time as it is a huge subject but, suffice to say, in our time here we have learned a great deal about sheep, their appetites and the importance of fences and tree-guards. I sub-divided the plot with dirt paths into a series of beds that could be reached easily from either side with a hoe. 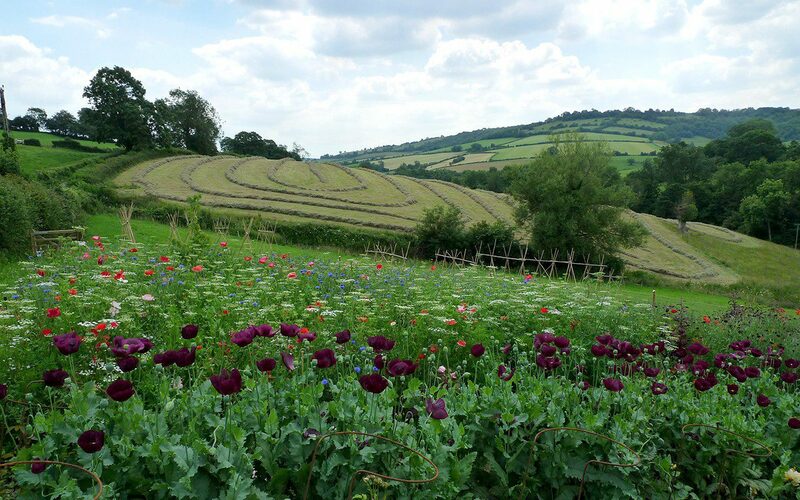 It was a practical decision that freed me up to grow things in rows where they could be observed and easily tended. It was an easy way not to have to worry about aesthetics at this point, and to focus on identifying the best plants for the site. We were also growing vegetables and soft fruit on this same piece of ground, and so I enjoyed the discipline of the orderly rows, the unconscious reference they made to the former market gardens, and the liberation from the expectation that a garden must be a designed composition. 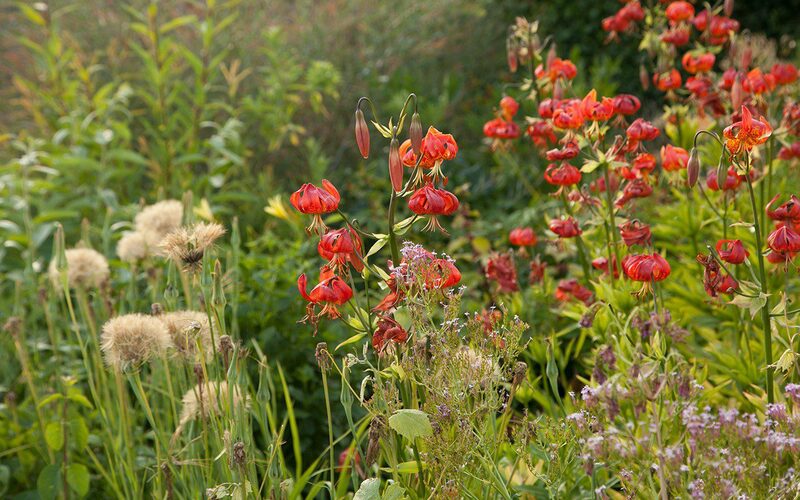 The plot has reminded me of working on the trial beds when I was at Wisley and I have been free to observe and experiment in this laboratory. Compared with Raymond’s old vegetable patch digging over the new ground was like turning cake mix. Where it has been converted from pasture, the soil is deep, dark and hearty and, that first summer, I understood why there had been market gardens here. Tilted at the perfect angle to receive the south facing light and exposed to it for as long as the sun shone, my garden grew like I’d never seen anything grow before. Sunflowers threw themselves at life, towering to over ten feet by the end of the summer. I grew fifty-six dahlias, because there was the space to absorb their flamboyance, and a collection of two-dozen David Austin roses, each lined out neatly, and easy to tend. I was able to devote a whole bed to peonies, one to lavenders and another to irises. All with the intention of watching and waiting to see which were most gardenworthy. That first spring I sowed three separate panels of Nigel Dunnett’s Pictorial Meadows annual mixes. 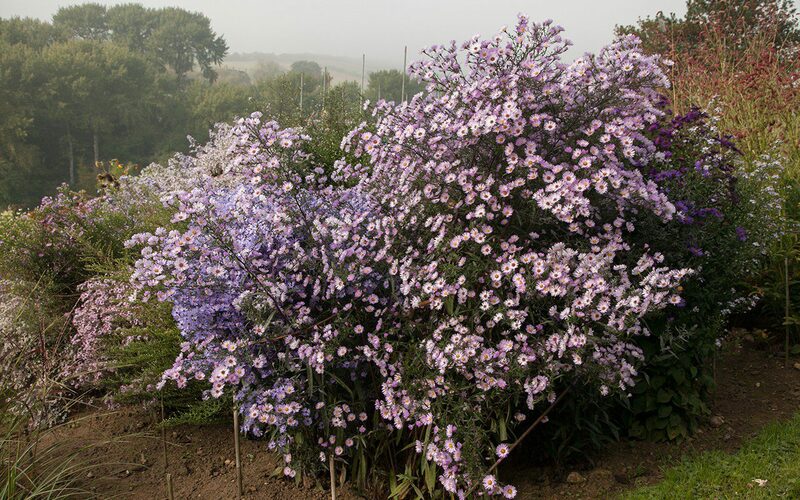 I had grown them in clients’ gardens, but had never had the space to experience growing them at close quarters for myself. It was like starting all over again. One world inside the fence, revealing itself through growing, another beyond revealed through a slow and informed process of looking and steering. We quickly learned that gardening on a slope was hard work. Every move has to be negotiated with the incline, the push and the pull of manual labour considered very carefully. 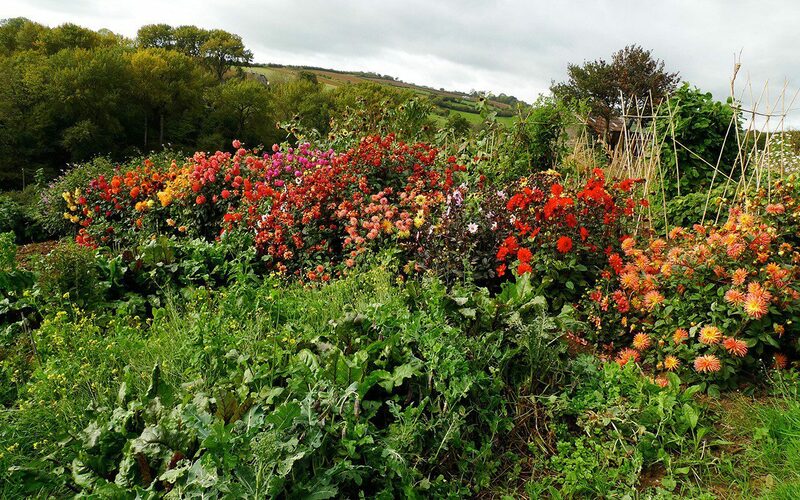 Knowing how much to fill the barrow and how to place it on the slope to avoid losing a load, which way to dig and which direction to hoe, how to place yourself to make weeding less strenuous, all were a whole new way of gardening for me, having always gardened on the flat. It is a windy site too. My daylilies from the sheltered garden in Peckham grew to half their height in the exposure of this sunlit hillside. The hellebores flagged without shelter, but everything that liked it stood solid and healthy as an athlete. The garden grew, but at a price. Gradually, from nurseries, specialists, friends and plant fairs, I accumulated a collection of special martagon lilies, an assortment of asters, salvias and sanguisorbas and countless other treasures. 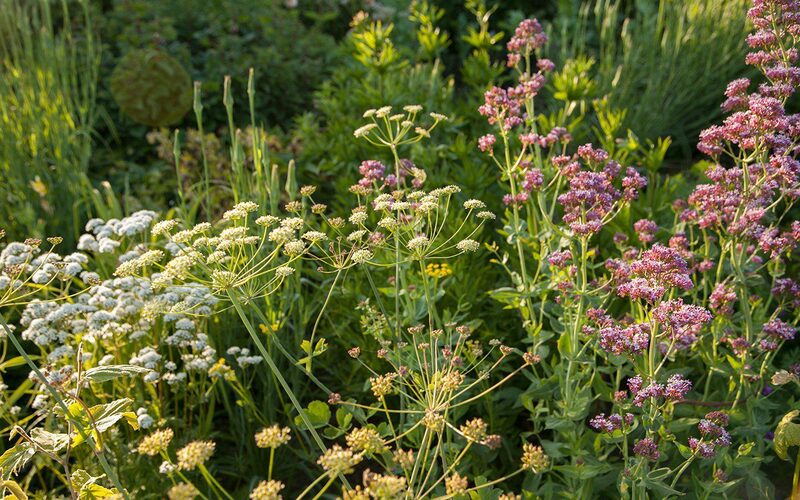 So, rather predictably, my growing collection of herbaceous, flowering plants rapidly started to crowd out the vegetables, and I soon found myself planning a new vegetable garden with level ground and ease of access. We made a start in the third summer, forming a flat terrace to the west, extending the ridge that the buildings sit upon. 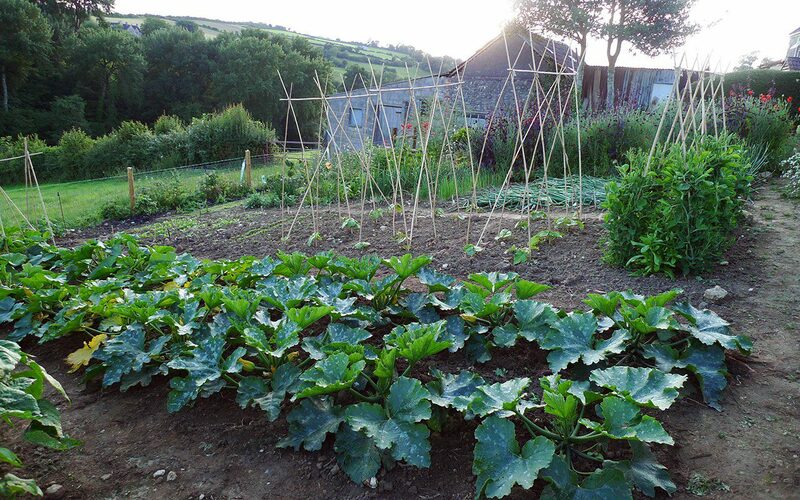 In doing so, the spine of garden activity was taken out from the house, linking the practicality of vegetable and fruit growing to the barns and the newly planted orchard beyond. 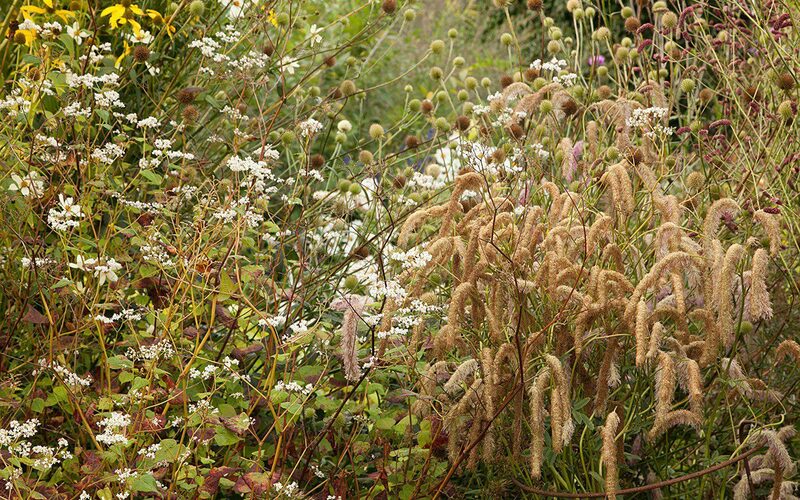 I knew early on that I didn’t want to be able to see an ornamental garden from the house, that looking into the complexity of a planting was something I wanted to choose to do, rather than have it demand my attention. 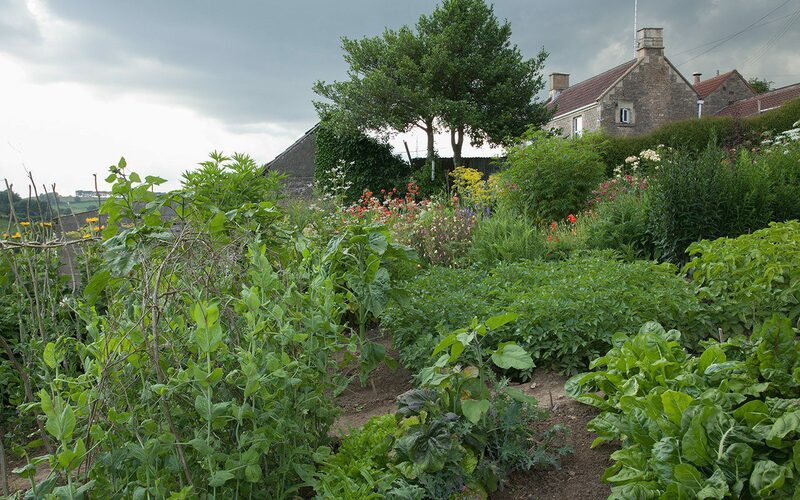 So, with the vegetable garden positioned to the west, I am now planning to sweep the landscape up to the front door from the south and develop the gardened garden in a complementary span to the east. As I write, at the end of our fifth winter here, I am surrounded by the aftermath of building works, which have seen us modernise the house and convert the milking barn into a studio where we can work. From here we look onto the ground that was once Raymond’s vegetable patch and, now that the battleground of construction has settled, and with five years of looking behind me, I am ready to make my move. 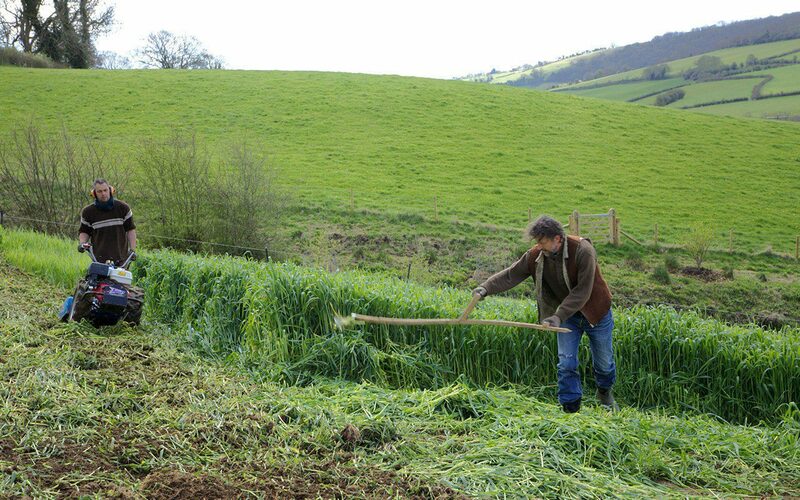 The winter has seen me rationalising the stock beds of plants and we have just turned in a green manure crop of winter rye, so that soon, when the weather is dry enough to get on the land again, I will be able to start forming the garden. The survivors from those carloads of plants that arrived here from Peckham five years ago are finally ready to be found a home.